1. Microbalance - what are they? A micro balance or ultra-microbalance can deliver the highest precision of all lab balances. This high sensitivity in micro balance design allows for the weighing of sample quantities with weight as low as 30 μg. 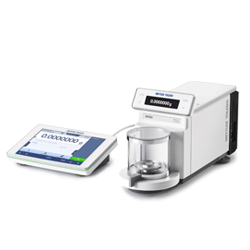 Microbalances offer a capacity of up to 10.1 g with readability down to 1 µg (0.000001g). Ultra microbalances offer an incredible full resolution of 61 million digits, with a capacity of 6.1 g and 0.1 µg readability (0.0000001g). METTLER TOLEDO’s portfolio includes a micro-analytical balance. It has a readability like a micro balance, 1 µg, andd the shape of an analytical balance, with an outer and inner weighing chamber.The XPE micro-analytical balances deliver the highest capacity, coupled with the lowest possible minimum weight . This enables dosing of very small amounts directly into a "large" tare containers. 2. What is special about microbalance design? A micro balance consists of two components - one containing the electronics and the other, the precise mechanical measuring cell. This separation eliminates the effects of temperature and the influence it has on the performance of your micro balance scale. METTLER TOLEDO XPR Micro and Ultra-Microbalances are equipped with an Active Temperature Control system (ATC™). This increases the weighing stability and enables an outstanding level of performance and accuracy. 3. What is a microbalance used for? Microbalances and ultra microbalances are frequently used in product testing and quality assurance labs, as well as chemistry labs and mining to measure small amounts of powders and minerals. Medical device research might also employ a micro balance to check uniformity in critical components. Micro balance applications include: particulate matter (filter) weighing, pipette calibration, analysis of pesticides, and stent weighing. Ultra micro balance applications include: particulate matter (filter) weighing, ashing or incineration, drying, measurement of coatings, and checking spillage quantities. 4. Which METTLER TOLEDO microbalance is right for me? 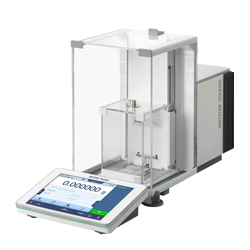 To find the appropriate METTLER TOLEDO micro balance for your needs, first define the smallest amount you need to weigh and how accurately you need to weigh it (i.e. acceptable tolerance) to determine the precise micro balance you require. Every measurement on any balance is subject to uncertainty - understanding this uncertainty is key to ensuring accurate results and the avoidance of errors. When weighing small samples on a microbalance, uncertainty is almost entirely due to repeatability (i.e. at the low end of the weighing range of a specific balance). It is not the readability that determines the accuracy of a weighing instrument, but rather its repeatability, or depending on it, its minimum weight capability. Ask your METTLER TOLEDO consultant about GWP® Recommendation which helps you select the right weighing instrument for your own individual requirements. 5. What are the challenges and solutions to get stable measurements on a microbalance? A micro balance is an extremely sensitive instrument – the slightest disturbance caused by environmental influences or user interaction can significantly affect measurement stability. All possible sources of vibrations should be avoided when using a micro balance. Microbalances are highly susceptible to air currents, dust, and fluctuations in temperature, and should only be used where ambient temperature and humidity are maintained at a stable level – away from vents, windows, and doors. Ideally the balance should be set-up on a solid workbench - preferably a dedicated weighing table that can remain optimised for micro balance use, free from draughts or high traffic. When a micro balance is first connected to the power supply or switched on, a minimum warm-up time of 6 hours is recommended for ambient temperature adjustment. When using the micro balance, be sure to minimize convection flows inside the weighing chamber, which can negatively impact results. Only handle samples with tweezers, and allow acclimatisation to room temperature. When placing the sample onto the micro balance, the door should be opened to a minimum degree, for as short a time as possible. Follow METTLER TOLEDO’s dedicated guide to weighing, 10 Steps to Successful Micro-Weighingand get further tips on how to deal with challenges when weighing with microbalances, including determining proper balance location and calibration. 6. How to weigh on a microbalance? Always wear gloves while working with microbalances – fingerprints and oil from hands affect results. To start a weighing operation, open the door and place a container on the pan using tweezers. Close the door and allow the value to stabilize. Tare the micro balance. To avoid spills in the balance remove the container or weighing boat, dose the sample outside the weighing chamber, and place the sample on the weighing pan. Close the door and wait for stability. Record the net weight or repeat the procedure until desired weight is reached. A micro balance is highly sensitive to movement - do not touch the bench while waiting for the balance to stabilize. Clean the balance, tools and workspace after each use. The draft shield of METTLER TOLEDO’s XPR micro balance provides easy 360° access to the weighing pan and all-round visibility. There are no edges or corners where sample material could become trapped, and all parts can be removed, cleaned, and replaced in a few simple steps. 7. How to perform calibration, adjustment and routine tests of a microbalance? The accuracy of a weighing device is determined by correct micro balance calibration - performed by a qualified service provider only. The calibration certificate proves a micro balance is working correctly, user routine balance testing detects potential issues in performance within a calibration interval. Automated adjustment functions with internal test weights, such as FACT or proFACT, ensure that the balance maintains accuracy, even during fluctuations in ambient temperature. Weigh even the smallest amounts of your valuable samples directly into larger tare containers to save material and cost. StaticDetect™ measures the weighing error due to electrostatic charging and provides a warning if tolerances are exceeded. Quality assurance functions actively monitor that all relevant conditions for correct weighing are satisfied. Connect your XPR balance to LabX software, which helps you meet MHRA and FDA 21 CFR part 11 requirements for data integrity. Our laboratory catalog gives a complete overview of all METTLER TOLEDO laboratory products and solutions. It presents our broad portfolio of innovative products, software solutions and our service offering. It gives an overview of where you can find valuable application and laboratory know-how in order to stay up to date. Maximize the quality of your weighing results within ten steps and make the delicate process of micro-weighing more efficient. Whether you want to weigh several kilograms or just a few milligrams, XPE weighing and dosing solutions offer you outstanding weighing performance and innovative technologies to help make your daily tasks easier, error-free and compliant. Practical advice on getting started with lean lab. Lean tools and methods for use in established labs or new lab design. Weighing is one of the most common tasks in the laboratory. Balances have now been perfected to such a degree that no special weighing rooms are needed. Explore how to weigh in the right way. Technological advances in electronics have considerably simplified the operation of balances, reducing weighing times. Moreover the touchscreen digital display makes operation of the balance intuitive.